This diagram shows the setup for the X-ray experiment that explored chirality, or handedness, in a layered material. The blue and red spirals at upper left show the X-ray light used to probe the material. These X-rays scattered off the layers of the material (arrows at upper right and associated X-ray images at top), allowing the researchers to measure chirality in swirling electrical vortices within the material. Image: Berkeley Lab. Scientists at the US Department of Energy's Lawrence Berkeley National Laboratory (Berkeley Lab) have used spiraling X-rays to observe, for the first time, a property that gives handedness to swirling electric patterns – dubbed polar vortices – in a synthetically layered material. This property, also known as chirality, potentially opens up a new way to store data by controlling the left- or right-handedness in the material's vortices, in much the same way magnetic materials are manipulated to store data as ones or zeros in a computer's memory. The scientists said the behavior could also be explored for coupling to magnetic or optical (light-based) devices, which could allow better control via electrical switching. Chirality is present in many forms and at many scales, from the spiral-staircase design of our own DNA to the spin and drift of spiral galaxies. It can even determine whether a molecule acts as a medicine or a poison in our bodies. A molecular compound known as D-glucose, for example, which is an essential ingredient for human life as a form of sugar, exhibits right-handedness. Its left-handed counterpart, L-glucose, though, is not useful in human biology. "Chirality hadn't been seen before in this electric structure," said Elke Arenholz, a senior staff scientist at Berkeley Lab's Advanced Light Source (ALS), which is home to the X-rays that were key to the study. In experiments reported in a paper in the Proceedings of the National Academy of Sciences, the scientists were able to distinguish between left-handed chirality and right-handed chirality in the material's vortices. "This offers new opportunities for fundamentally new science, with the potential to open up applications," she added. "Imagine that one could convert a right-handed form of a molecule to its left-handed form by applying an electric field, or artificially engineer a material with a particular chirality," said Ramamoorthy Ramesh, a faculty senior scientist in Berkeley Lab's Materials Sciences Division and associate laboratory director of the lab's Energy Technologies Area, who co-led the study. Ramesh, who is also a professor of materials science and physics at the University of California (UC), Berkeley, custom-made the novel material. Padraic Shafer, a research scientist at the ALS and the lead author of the study, worked with Arenholz to carry out the X-ray experiments that revealed the material’s chirality. The material comprised a layer of lead titanate (PbTiO3) and a layer of strontium titanate (SrTiO3) sandwiched together in an alternating pattern to form a material known as a superlattice. Such materials have been studied for their tunable electrical properties, which make them candidates for components in precise sensors and for other uses. Neither of the two compounds showed any handedness by themselves, but when they were combined into the precisely layered superlattice, they developed swirling vortex structures that exhibited chirality. "Chirality may have additional functionality," Shafer said, compared to devices that use magnetic fields to rearrange the magnetic structure of a material. The electronic patterns in the material were first revealed using a powerful electron microscope at Berkeley Lab's National Center for Electron Microscopy, a part of the lab's Molecular Foundry, although it took a specialized X-ray technique to identify their chirality. "The X-ray measurements had to be performed in extreme geometries that can't be done by most experimental equipment," Shafer said. 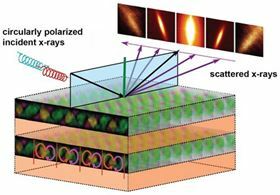 This involved using a technique known as resonant soft X-ray diffraction to probe periodic nanometer-scale details in the material’s electronic structure and properties. Spiraling forms of X-rays, known as circularly polarized X-rays, allowed the scientists to measure both left-handed and right-handed chirality in the material. "It took a lot of time to understand the results, and a lot of modeling and discussions," said Arenholz, who is also a faculty member of UC Berkeley’s Department of Materials Science & Engineering. Theorists at the University of Cantabria in Spain, together with their network of computational experts, performed calculations of the vortex structures that helped in interpreting the X-ray data. The same science team is now pursuing studies of other types and combinations of materials to test the effects on chirality and other properties. "There is a wide class of materials that could be substituted," Shafer said, "and there is the hope that the layers could be replaced with even higher functionality materials." The scientists also plan to test whether there are new ways to control the chirality in these layered materials, such as by combining materials that have electrically switchable properties with those that exhibit magnetically switchable properties. "Since we know so much about magnetic structures, we could think of using this well-known connection with magnetism to implement this newly discovered property into devices," said Arenholz.